On my flight to Germany in the summer of 1984, engine trouble forced us to land in Düsseldorf rather than in Frankfurt as planned. Because Düsseldorf expected no international flights that day, nobody was working in customs. My passport went unstamped, and I waltzed into Germany uncounted. How very un-German. Several weeks later, my group visited Berlin. The Wall would not fall for five more years. 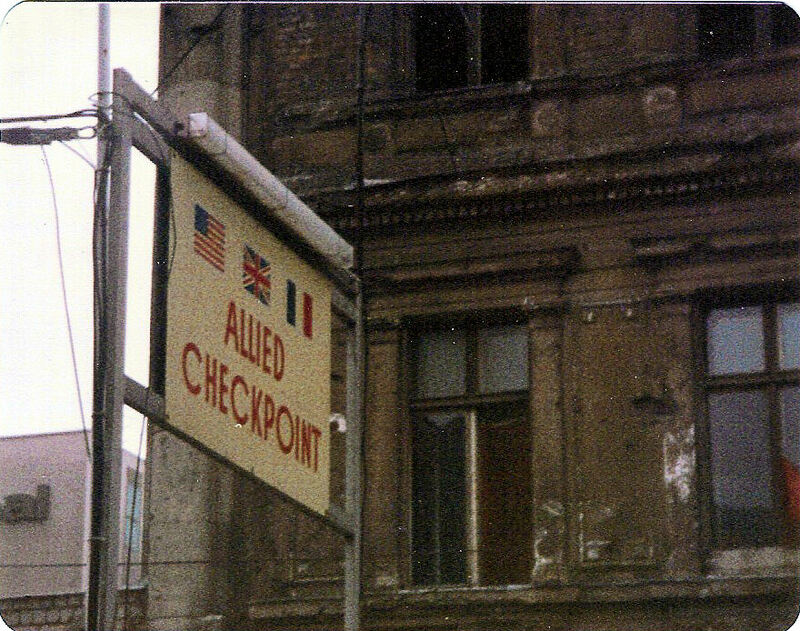 At Checkpoint Alpha on the East German border, grave, armed border police in fitted olive uniforms boarded our bus and, without looking at or speaking to anyone, collected all of our passports and exited. They made us wait more than an hour, our anxiety growing, before they returned with our passports (all tossed into a box) and waved us through. Each passport had received an East German stamp. The road from there to Berlin was bounded by walls so tall that we couldn’t see over them even from our bus seats way up high. I guess the communists didn’t want you to see the glorious living conditions on the inside, or everybody would want to move there. Several hours later down that road we were easily waved through the checkpoint at the West Berlin border. A few days later we crossed into East Berlin to see the sights. 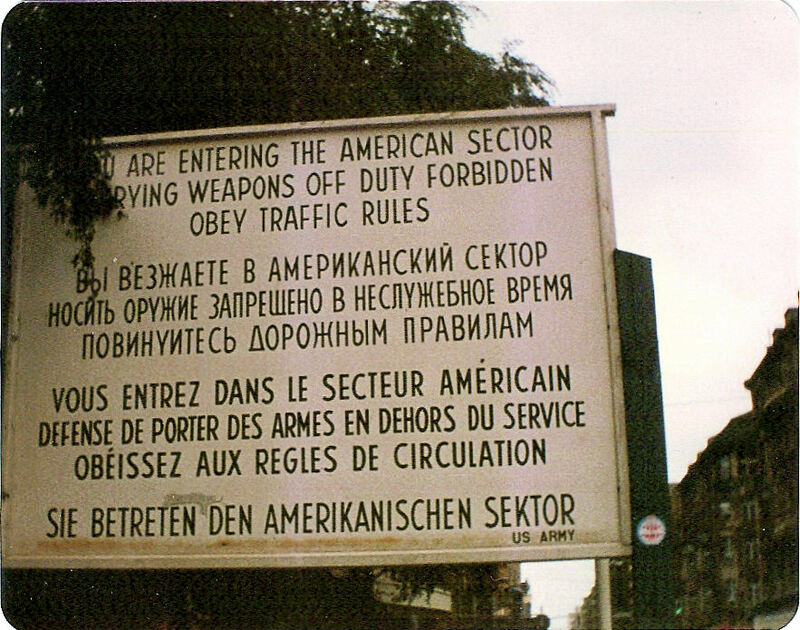 At the famous Checkpoint Charlie, stone-faced border police once again boarded our bus, collected our passports, and made us wait for a long time before they returned them all stamped. 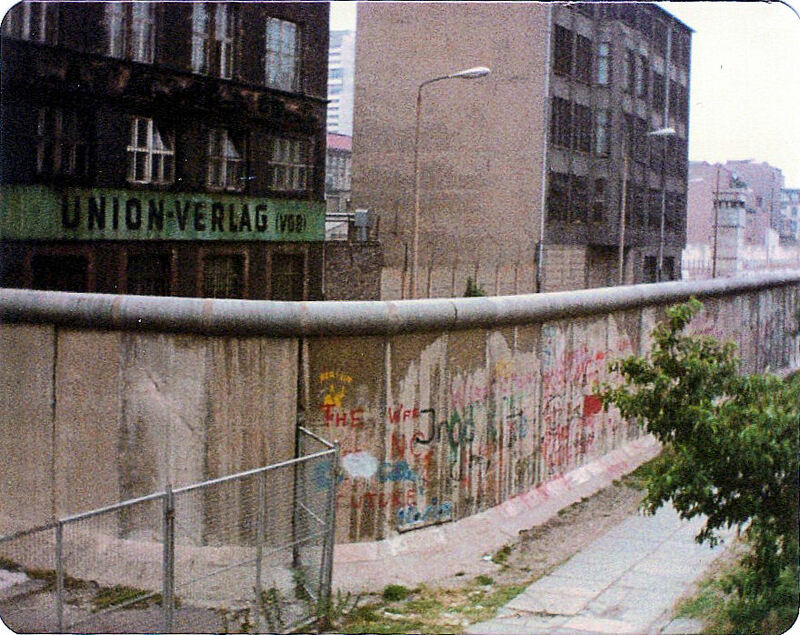 In East Berlin I walked in the Alexanderplatz, stood in line to buy a communist propaganda rag, er, newspaper (the top story that day was essentially how President Reagan was an idiot), drank beer and laughed with teenaged East Berliners, and tried to use a fetid underground open-pit public restroom. Shudder. I held it until we got back to the west. In West Berlin, I bought a book called Durchschaut die Uniform, or See Through the Uniform, telling stories of border guards — not only about the distasteful jobs they did, but about the people they were. The last page showed two pictures of four border guards, the first with their stony faces and the second with wide smiles. The second photo seemed so strange! But I got the book’s point, which was to have a heart because these guards were real people. So I decided to put on a pleasant face for them on the way home. As we left, we passed back through Checkpoint Alpha. Dour border police boarded our bus and collected passports. When they took mine, I looked them in the eye and smiled. It was met with indifference. They just took our passports and inspected our bus for things we were not allowed to take out. Inspection successful, they left and we were free to pass through. We made our way back across free Germany. A few years later I renewed my passport when it expired. I wondered if anybody at the passport agency noticed that my old passport contained stamps only from communist East Germany. Then Iraq invaded Kuwait and the United States rode in on its white horse ostensibly to save the day. It was war, and I was draftable, so I was nervous about what might come. My mind reeled for several seconds. My passport! They must have a file with my name on it! They think I’m red! They’ve come to carry away the commies! My brain screamed, “Talk privately? Aren’t you here to purge the land of communists in the name of national security?” I was growing dizzy. I managed to mumble, “Sure, come inside.” I led him to an empty room and we sat down. I’ve heard stories about what happens to cars that are accidentally shifted into reverse while going 40 miles per hour. Namely, the car’s transmission suddenly disintegrates, distributing its pieces along the road. This is what happened to my brain at that moment. In shock, I managed to say, “Yes, I know Bobby.” Where the heck was this going? Bobby, a college friend and roommate, was a sharp, smart guy who majored in computer science and is now well-respected in his field. 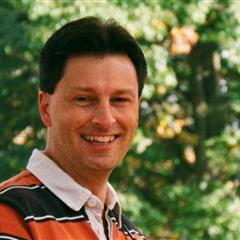 His senior year, as he looked for his first job, he applied at the National Security Agency. He was pretty jazzed about the job, but he never heard back from them. He applied for other jobs and eventually accepted one in Silicon Valley. So for twenty dull minutes he asked me questions about Bobby’s associations and character. I told him what I knew and he went on his way. I felt sorry for the guy having to drive all over the place talking with Bobby’s friends and family, needlessly looking for skeletons to qualify Bobby for a job he no longer wanted. I tried to empathize with the guy, but he’d have none of it. He stuck to his questions until he had no more to ask, and then he got back into his gray sedan and drove away. I learned that it’s fruitless to try to connect with a government official doing a distasteful or useless job. They just want to get it over with. But at least there was no internment camp for me! Some this never change. A good friend of my oldest son accepted a job offer from the government upon graduation with an advanced degree in mathematics. It was a provisional offer because he was going to need a security clearance. He moved home to wait until he could get started with his adult life. He kept being told that the clearance would be forthcoming soon. After about 5 months he gave up waiting and found a job in the private sector. A great story. East Berlin would have made me nervous too. Makes you wonder how many talented people the government doesn’t get to hire. We have similar stories in common. I finished number four in my class of twenty two fellow service men. And because I did well, I stepped out on ambition and decided to join the second of the two branches, to have more opportunities and a career…BIG MISTAKE! Because of Reagan’s election in 1980, several things changed in just a few months, which negatively affected my opportunities in that particular branch. I’m a big ice hockey fan, and had some Soviet literature in my locker, on the subject. Oleg Spassky’s book on training regimens and history of the USSR’ players and their international success, and book of short stories by Tredryakin…no big deal, nothing regarding espionage or the overthrow of the government. Long story short, years later, when I applied for a tourists visa to the USSR at my local passport office, the clerk left the window with my application and went into the office behind her, and then a man in a suit came out and glared at me with his face turning several shades of red, as he seemed to be studying me, and then went back inside without saying anything to me, and then the clerk came out and magically pulled out a form from a shelf underneath the counter. I didn’t think anything about it, because I secured my visa. Until a couple of days later when a guy I had been in the service with eight years earlier, pulled up in front of my workplace in a brown government crown victoria, wearing a brown polyester suit, and looked to have a stroke, when he made eye contact with me. I usually would have already been gone for the day, but that day I was waiting for a lady friend to pick me up to head over to Berkeley Iceland, and she was running late. He was so busy looking for the street address, (tourist) and trying see if it was a tow away zone he was pulling into, that he didn’t see me until it was too late to play it off. I said hello, which startled him and he mumbled something in my direction, and hurried himself inside. It all fit; I remembered this guy was a big Reagan man, believed that no one, including the handicapped, were entitled to relief nor compensation. And he had already received high security clearance before going away to “radioman” school…sure…radioman school. Anyway, then the same as you, (sort of) the Secret Service, sent an agent a couple of years before that, to interview me regarding a neighbor’s application for clearance…you’re asking me?! It was a great time to be an American! The end, finally, of the horrors of Vietnam, and brand new non-facist President, the success, and pride of the U.S.’ Summer Olympic stars, etc. etc. I just never regained that level of fanaticism. I suppose I could have been sent to Leavenworth, for some of things I said and did, but I could’ve sued and brought attention to their racist, anti-semantic attitudes and practices that had limited advancement and possible careers. And I’m going to assume that’s why they didn’t attempt to prosecute. There was more to it than just what I said, and did and didn’t do. I was spending my liberty in Canada, and probably some other things that I’m not even aware of that surely caused me to stand out. While I was in the Soviet Union (it was still the Soviet Union for a few months longer) I was asked to stay by my hosts, and their friends, which was flattering, and had I not already settled into my life back here, I would’ve stayed. And had it been 1980-81 instead of 1990, I would’ve stayed…perhaps another BIG MISTAKE! Nice, at least you knew enough about your buddy that you could answer the questions properly. I once got a call from the passport office regarding a former co-workers renewal. Although we’d hung out quite a bit when we worked together we were now working in different cities and hadn’t seen each other in years. As the bureaucrat was asking personal questions I was finding out how much I didn’t know about my friend, where he was born, how old he was or where he was currently working. It wasn’t going well until she asked me his street address and I said “Oh that’s easy, it’s Guppy Street. How could I forget that name?” We shared a laugh over that and he got his passport. Interesting that they needed to interview you on a passport renewal! I don’t know that we do that here in the States. The sneaky way to wrap up this story is for the NSA and Bobby to pretend Bobby got a job in Silicon Valley, but he actually worked for the NSA. Who knows…maybe that’s exactly what he did! This is an awesome story! I can’t believe they would come to your work and ask to talk to you.